Last summer I discovered this fantastic bacon ranch potato salad from Kraft. 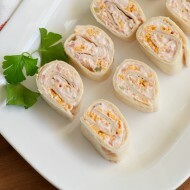 It is fabulous for barbecues and picnics and is simple to prepare. I’ve made it several times since and because it is such a family favorite, I wanted to share. If you want to add more color to your salad, you can use more than one color of sweet pepper. For this time I used half of a red pepper and half of a yellow pepper. I love the way it brightens up this salad! I’ve made a few changes to suit my family’s tastes. 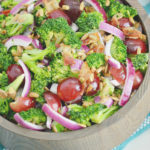 Feel free to switch out ingredients for your favorites such as using red onion instead of green onion, add celery or even broccoli. 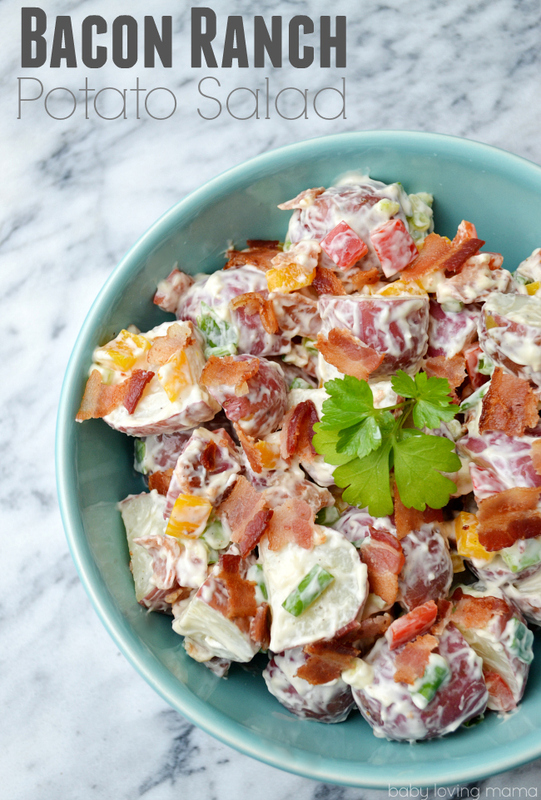 The only thing you won’t want to skip is the delicious dressing, potatoes and bacon. Because you know, bacon makes everything better! It really adds so much to the salad. In large bowl, whisk Miracle Whip, ranch, pepper and garlic powder until blended. Add vegetables and four slices of bacon, crumbled. Crumble remaining two pieces of bacon over the top right before serving. 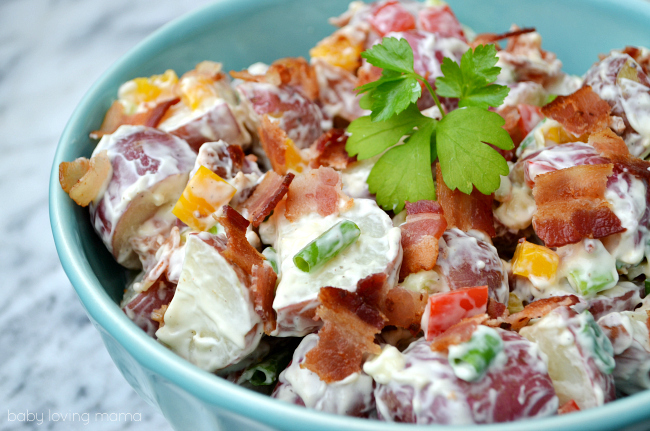 You won’t be able to resist the combination of red potatoes, bacon and ranch in this bacon ranch potato salad. And because you don’t have to peel the potatoes, it is quick to prepare. If you manage to keep any for leftovers, know that it tastes just as good the second day as the first. 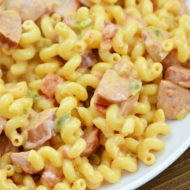 See the original recipe from Kraft. I love this! I make a similar BLT salad minus the Miracle Whip and homemade buttermilk ranch dressing (LOVE). Yummy!! 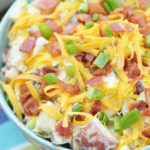 I had a baked potato salad at a picnic last year and loved it, I was just thinking I needed to find a recipe for that. 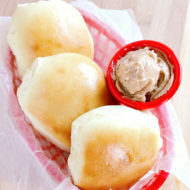 I will definitely be trying this one out (either for our upcoming soccer campout or mothers day family get together!). Thanks so much for sharing. Yum! This looks fantastic. I love that it’s mostly ingredients I usually have in the pantry/fridge, too. 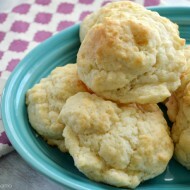 I need to try this but i’ll have to make a double batch for my family. This looks so good! I love new recipes. Pinning now Thanks! This looks so creamy and good. Another great one to print and make soon. 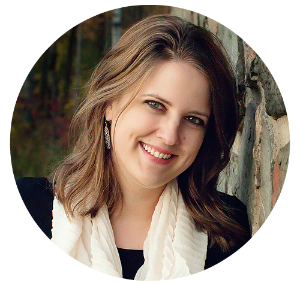 You have some awesome recipes on your blog. I have such a stack of recipes to try…about time too because I am tired of the same old things. Anything with miracle whip and bacon in it my husband will totally love. It looks delicious! 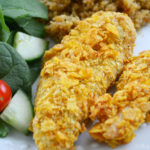 I can’t wait to try this one, always looking for new recipes to try on the family. hmmm I never thought of adding the salad dressing- it looks soo good I would like to have this now!!! 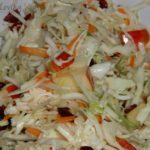 It would definitely make the potato salad special – I can’t wait to try it! Always have potato salad when have a cook out. This would be ay yummy surprise for the next one we have. It is so awesome to see a potato salad that has this much color – for sure have to add bacon to my potato salad next time – why didn’t I think of that? That looks so good! 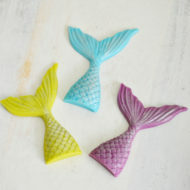 Perfect for summer BBQs! 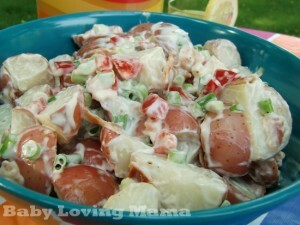 Potato salad seems like a staple in the summer time. 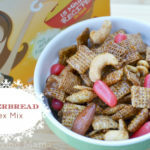 Thanks for sharing your twist with Idea Box. 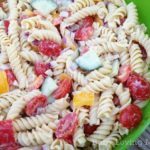 I have had bacon ranch pasta salad but never potato salad this looks so yummy. I can’t wait to make it. Thank for linking up this week on the #HomeMattersParty link up. Looking forward to seeing what you link up this next week. What a perfect potato salad with everything lip smackin’ good you could want. I’d love to make this! !